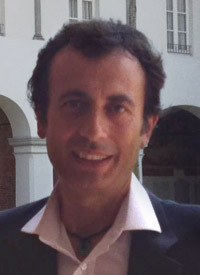 Guido Caldarelli studied Statistical Physics, and works in the field of Complex Networks. He got his degree in 1992 in Rome (La Sapienza), his PhD in 1996 in Trieste (SISSA). After Postdocs in Manchester and Cambridge he became firstly research assistant in INFM and then Primo Ricercatore at ISC-CNR where he is still working with many friends and colleagues. Presently he is Professor in Physics at IMT Lucca, and a LIMS Fellow.